The 145ft schooner, Shenandoah of Sark – for those of you that do not know the yacht – was originally built in 1902 in the USA to a design by Theodore Ferris. During 1996 the yacht was given a total rebuild by McMullen & Wing in New Zealand. I joined the yacht in the spring of 2002 as master. Whilst anchored off Portofino in the early summer of 2003 the owner returned to a subject that had first raised its head during my meeting with him when being interviewed for the master’s position. “Do you think that Shenandoah is a suitable boat for going to South Georgia?” My reaction, having sailed in the Waters of the Falklands in my youth, was to hesitate and then comment that there was no reason why she should not go. She was almost new, she was steel and she was strong and as many old timers know many an exotic voyage is spoken about but rarely are they undertaken! We sailed from Palma de Mallorca on the 15th November with an ETA in Port Stanley of December 25th. The yacht had been stripped of all unnecessary hot Weather gear, which we shipped to Antigua t0 await our arrival after South Georgia. Of course a great deal of cold weather gear was brought on board including skis, poles, tents, boots, sledges, provisions, ice axes, ropes, crampons plus a 300 kilo anchor. A John Munford designed, owner modified, gimbaled table was also built by the Astilleros Mallorca shipyard which, when put to the test, worked incredibly well. Suffice to say the 7000-mile trip South did not pass without its drama and many changes of plans. We were twelve in the crew divided into three Watches. The watch officers were myself, the mate and the 2nd. The chief engineer did not do watches and neither did the chef. My eldest daughter, Sophie, came along as a supernumerary to be dropped off in Mar del Plata in Argentina Where she was to stay with a friend for a while before returning home. I wanted enough time in hand to have a couple of spare days in Port Stanley but we were running behind schedule. We needed that time just to prepare the yacht for guests and for the crew to have a quick run ashore. As things turned out there was a fairly major change in the plan when the boss called the yacht to say that he had taken a fall and had broken his shoulder. The broken shoulder had required complex surgery and the doctors had forbidden him to sail on the yacht. The schedule had changed and with the pick up date for the guests now put back to the 3rd January We found ourselves with a day or so in hand and with the pressure off. Things had definitely changed since I sailed out of the port in my 38-foot gaff cutter in 1978. There was no doubt that Port Stanley looked prosperous, the result of a bonanza in fishing license fees and cruise ship tourism. The day after I sailed out of Port Stanley with Jenny Wren in 1978 I sat down and made a list of all the people that I had met in the back of the logbook. Once our clearance was completed l handed this list over to the Customs officer for an update. It was to be expected that after 25 years some had left the Islands and some were still there and quite a few of them were dead. Lying out at anchor in Stanley means being on constant alert for the weather, as while it is a fine anchorage it is shallow and there is a good fetch from the West from where the wind comes with great force. For the general relaxation of the crew it was going to be better if we could get alongside for the holiday period. The only berth was on the Falkland Island Company jetty, which was all piles and tractor tyres, and no way that we could fend off in the case of a blow. We had no choice but to wait until the inter-Island ship run by the Falkland Island Company, came in. It was in the late afternoon of Christmas Eve when we shifted across the harbour to go alongside Tamar. There was not a breath of wind and we could hear the sound of the carol service coming from the Anglican cathedral. Some of the local lads were having a barbecue on the jetty in the late afternoon, a cheerful affair attended by the crews of the Tamar, the Falkland Island company launches and Shenandoah. After it was over and feeling that maybe Christmas was passing us by three of us went to the evening mass in the Catholic church where we were joined by the chef and the second mate followed shortly by the Philippine engineers. After the service I decided to skip the secular activities in the Globe Tavern and went back on board. Christmas Day was a day of excess in both food and drink. Being unable to stand the pace I persuaded the mate and the stewardesses that we needed an adventure and as the weather was fine, we took off in the RIB. We went down to the East end of the harbour and boarded the Lady Elizabeth, a three-masted barque that dragged her anchors many years ago and has being lying beam to the weather ever since. Unlike most of the wrecks or hulks in this part of the world, she is not covered in tussock grass and shags nests with a rotten deck through which you can fall, probably because in an Easterly gale the seas break right over her. There did not seem to be much change in her condition in the last twenty-five years, a bit more rusty and probably a bit more dangerous but at least there was no one there to wave us off. Boxing Day arrived and we had time on our hands now that we are respecting all national holidays. Tamar – having decided, in view of the lashing rain, to have a barbecue in one of the Falkland Island Company’s warehouses – invited us along. I ate and drank my fill and then went off to the races where it was cold and damp. £8 lighter after four races I decided to walk back to the yacht. I met a friend from my Jenny Wren days and invited him on board for tea, after which went to visit Jerome Poncet on his yacht Golden Fleece. 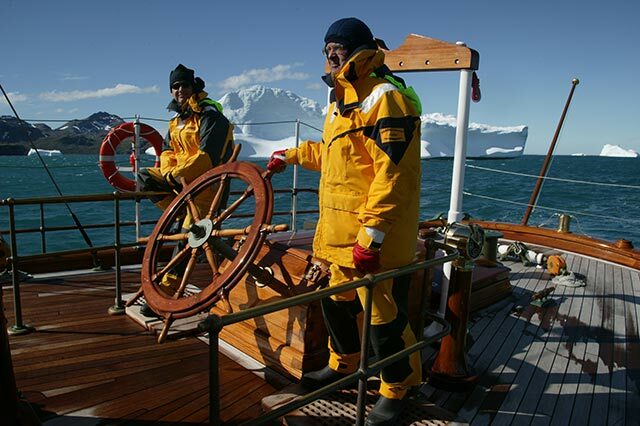 Jerome has been sailing in Antarctic waters for years and his name appears in many of the credits for films made there.